I used 22 gauge Artistic Wire to wire these up. Cut a piece that’s longer than you think you’ll need to wrap your first bead. I started with a 10 inch piece, and found that I only needed a bit over 8 inches. It’s better to have a bit too much than to end up short! The size of your bead will determine the length you need, so I really can’t tell you about this one. You’ll also need 2 sets of lightweight recycled beads from old necklaces (mine are recycled Lucite), two small round gold beads (mine are recycled plastic beads), and ear wires, whatever style you like. The tools you’ll need are the standards: wire cutters, flat nose pliers, and round nose pliers. 1. Create a wrapped loop with only one or two twists around the loop of your earwire. Thread the wire down through the larger of your two beads. 2. 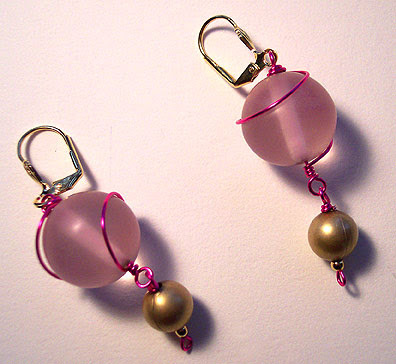 Create a small wrapped loop at the bottom of the large bead. Instead of cutting off the wire, wrap it upwards around the bead in several large loops. 3. At the top, wrap the end firmly around the wrapped loop that you already made and clip off the wire end. 4. With another shorter piece of wire, create a very small simple loop at the end. Thread on a small gold bead and the smaller of your two lucite beads. Create a wrapped loop around the wrapped loop of the larger bead.